FUTURE – Noun a period of time following the moment of speaking, writing; time regarded as still to come. Except for PUMA, who have always considered the Future to be here. FUTURE was already here back in 1952, when PUMA launched the first screw-in football studs ever, on the Super Atom. FUTURE was also here in 1968 when the legendary PUMA King came out and in 70’s was updated with a revolutionary flat structure that made it lighter. It was also the first ever boot to use Kangaroo leather introducing unprecedented touch, a perfect addition to Eusebio, Pelé, and Cruyff’s already awesome arsenal. FUTURE was here in 1982 when Diego Maradona played his first World Cup in the PUMA Torero boot. An invention by company founder Rudolf Dassler’s son Armin, that came equipped with a highly flexible DUOFLEX sole with two joint zones perfect for flexibility when turning defenders inside out. FUTURE was here in 1993, when PUMA produced the first shoe utilizing the super strong yet light weight material, Kevlar, the PHANTOM KEVLAR PRO. FUTURE was here in 2006, when PUMA released the V1.06, the first groundbreaking lightweight speed boot with a full textile upper on the market. FUTURE was here in 2014, when PUMA introduced the evoPOWER, designed to mimic the freedom of movement during the barefoot kicking motion to enhance a player’s natural striking ability. FUTURE is the first football boot with a truly customizable fit. NETFIT technology allows the wearer to lace their boots any way they want in order to fit perfectly, no matter the foot shape or lock-down need. The FUTURE is made for those players that change the game in an instant, those that play with instinct, and invent play on the pitch. That’s why we have a boot that allows for complete individuality in both fit and style. 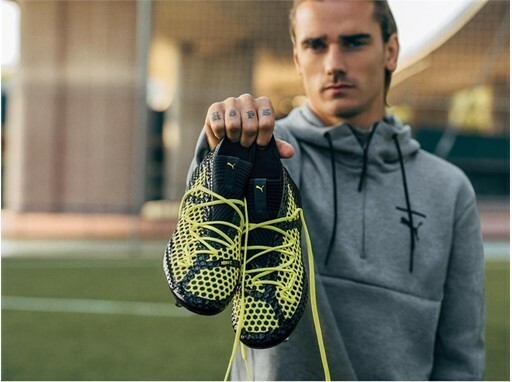 The FUTURE utilizes PUMA’s adaptable NETFIT technology initially designed for running and takes it to New Levels by applying it to the upper creating a boot that is aggressive in its aesthetic, unique in its appearance, and in its lacing system a purely individual fit experience. The lacing system is there to be experimented with, to adapt to your fit specifications, whether wide or narrow footed, and give you the ultimate lock-down. With its infinite customization options, NETFIT allows for the ultimate on pitch expression, allowing players to truly stand out with their own unique lacing designs. To further enhance the overall fit and feel of the boots the NETFIT upper has been fused to the evoKNIT sock and striking zones to create one form-fitting textile base layer, bringing the wearer a snug-fit whilst making sure the foot is closer to the ball on impact for that perfect touch. The evoKNIT sock has also been developed and has a much more dynamic and aggressive cut than past models before it. The sock has been designed to be non-restrictive and allow for limitless agility thanks to its specifically placed cuts, whilst the material itself offers supreme support and comfort throughout the game. The FUTURE also introduces the brand new RAPIDAGILITY outsole, made of super lightweight and reactive PEBAX and containing a mix of conical and bladed studs that are designed to bring the best results in traction and stability. Perfect for those quick turns of pace, and moments of quick footed brilliance that leave your opponents in a twisted heap. The FUTURE will be worn by our most instinctive and unpredictably creative players on pitch, but to those flair players whose individuality is as important in their style as it is in their play, the FUTURE is yours. INFINITE CUSTOMIZATION: NETFIT technology provides infinite lacing options for any foot, lock-down or style need. UNTOUCHABLE SPEED: Lightweight RAPIDAGILITY outsole allows for high speeds on the break and 100% acceleration. LIMITLESS AGILITY: evoKNIT sock and form-fit textile base provide the ultimate support for top on-pitch performance and agility. The FUTURE 18.1 NETFIT launch edition is a limited drop exclusive to selected key football retailers. The FUTURE silo will be commercially sold in 2018. Lycra 3D technology gives …..